It’s #mantramonday and our mantra today is #relaxation. When the week begins, we tend to turn our focus to weekly responsibilities. Work and family needs become priority and we can forget to set aside rest time for ourselves. Rather than turning to occasional self care, we can become wrapped up in cycles and patterns that can contribute to consistent, low-grade stress. Overtime, the repeated release of those stress hormones can take a toll on our bodies. Chronic stress can lead to high blood pressure, increased heart rate, and muscle tension. Setting aside time for relaxation is an easy and impactful way to support your wellbeing. This intention will help to reduce low-grade stress and offer you a greater sense of peace in all aspects of life. 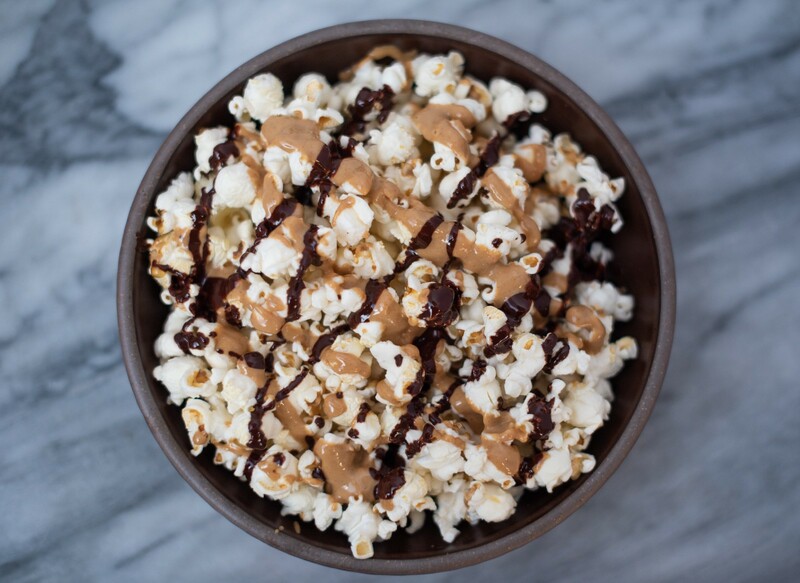 This CBD Superfood peanut butter & chocolate drizzled popcorn is a great accompaniment for some intentional relaxation time. Draw yourself a bath (and pop in a Blue Ridge Hemp CBD Calm & Relax Bath Bomb!) or snuggle up on the couch with a cozy blanket and your favorite movie. Munching on this sweet and salty snack will be a welcome hiatus from the business of your week, and it can even be a way to find relaxation while spending time with friends and family. In a large pot, heat regular coconut oil on high on the stovetop for 2 minutes. Add popcorn kernels, place lid on the pot, and shake pot while holding the lid in place. As the heat increases, your popcorn will begin to pop vigorously. When the popping subsides and there are long pauses in between kernels popping, remove from heat and move popcorn into a bowl. Sprinkle with salt and set aside. In a saucepan, melt peanut butter until it is smooth and ready to be drizzled. Heat another saucepan on the stove. Remove from heat and add CBD Superfood x Goddess Ghee Dark Chocolate Ghee until fully melted. Using a spoon, drizzle peanut butter and chocolate on top of the popcorn bowl. You can stir the mixture together so the popcorn is well coated, or leave on top for a subtle flavor addition. Enjoy!